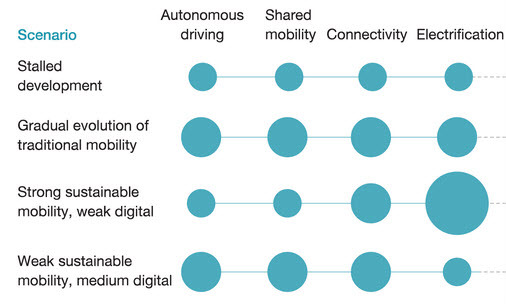 The best research on mobility is still this series of papers from the BCG. Like me, BCG is reserved about the U.S. market. I strawman McKinsey a little by focusing on U.S. car dealers. Their focus is on manufacturers, with a European orientation. The right way to worry about mobility is to ignore the interaction effects, and look at each trend individually. This is where I differ from McKinsey. They model three different outcomes – small, medium, and large – for each of the four trends. This gives them eighty-one different scenarios to evaluate (consultants love this stuff). My local BMW dealer has a lot full of i3s and i8s. Electric cars won’t change auto retail at all – service, obviously, but not sales. This “revolution” only affects dealers if Tesla succeeds in doing it without a dealer network. From my perspective, not having a dealer network is a weakness, and a sign that the company lacks confidence in its product. It turns out Jacques Nasser was right. Kids today will ride in a hamster box as long as it has satellite, wireless, navigation, and a sound system. Gone is my generation’s enthusiasm for hemi heads and dual overhead cams. No one drives a stick anymore, and the steering wheel will be next (see below). Connectivity will change auto retail the same way electric cars will – new features to sell and service. I have the BMW connectivity app on my iPhone. Connectivity in terms of telematics will open up new opportunities for service retention, as I described here. There are new opportunities in F&I, and even lot management, as people invent more things to plug into the OBD port. 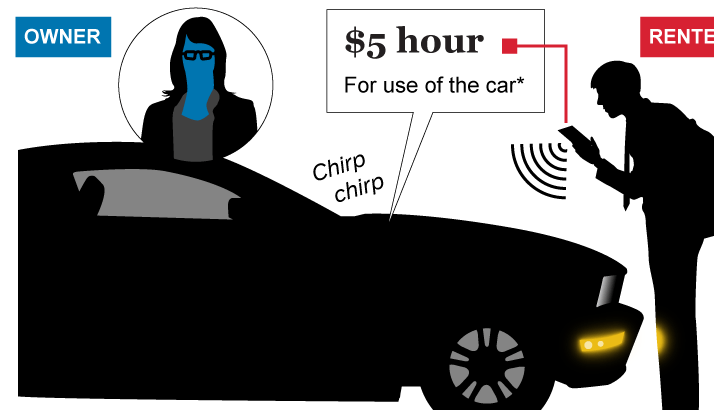 I am deeply skeptical about self-driving cars. People who promote them tend to focus on SAE level four, and overlook the greater challenge of full autonomy. I see self-driving in limited contexts, like self-parking and advanced cruise control. Check out BMW’s lane-departure technology. This is cool stuff, and what it means to car dealers is … more expensive cars! Remember that the nightmare scenario for self-driving cars only occurs when the cars are smart enough to be widely shared, i.e., robot Uber drivers. A car that can autonomously drive the kids to school is years and years away. A close examination of the technologies required to achieve advanced levels of autonomous driving suggests a significantly longer timeline; such vehicles are perhaps five to ten years away. Like “catastrophic anthropogenic global warming,” that date keeps moving out as we approach it. In 2012, Sergey Brin said self-driving cars would be widely available by 2018. In 2016, Mark Fields said no steering wheel by 2021. McKinsey, in any year, always says, “five to ten years from now.” For a clear-eyed look at the challenges, see here. For more about luxury driver assistance see here. That about does it for my deconstruction of three mobility trends that should not worry car dealers. Next week, I’ll report on that fourth one. Now that I am living in a big, modern metropolis, I can see shared mobility first hand. I may not even need a second car. I chose consolidation for the first of my megatrends series, because it’s the least controversial. Everyone seems to know it’s happening, and the records and rankings in Automotive News are dominated by big groups. This year, for the first time, NADA Data takes a look at consolidation. 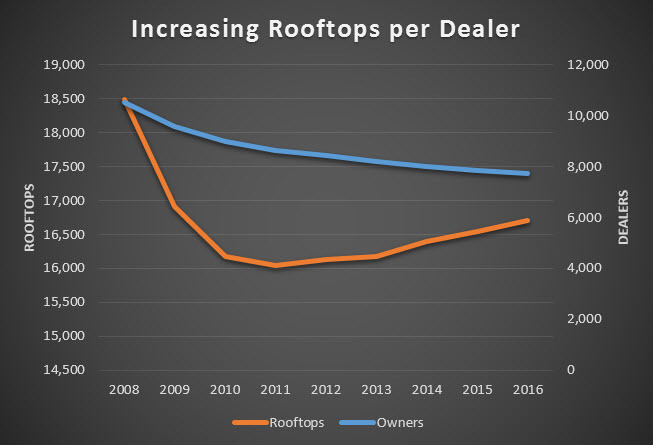 Probably the best single number to look at is the ratio of rooftops to dealers, which represents the average number of stores in a dealer group. This has grown from 1.8 to 2.2 over the last nine years – not exactly a revolution. I was a little surprised to see such small numbers, but this is an artifact of how NADA presents the data. NADA, logically enough, presents the number of dealers owning a group of a given size. I would have preferred to see the number of stores, not owners, in each category. This is a better reflection of the market coverage. To show the distinction, I plotted the total count of both rooftops and owners. You can see that, while the number of rooftops is recovering since 2010, the number of dealers is not. Next, I recast the data in terms of rooftops. 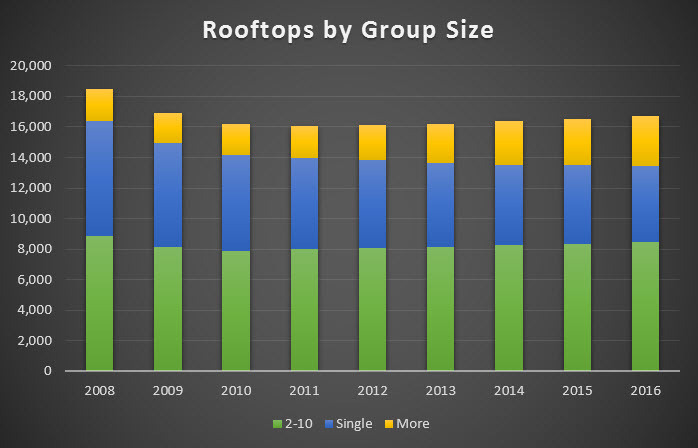 The number of rooftops belonging to groups of ten or more has almost doubled over the period, from 12.2% to 21.3%. Below, I have plotted the number of rooftops in three tiers, by size of the dealer group to which they belong. The 2 to 10 tier has been remarkably stable, numbering roughly 8,200. The single points have been in steady decline, losing 2,500 over the period. Dealers know that single points are vulnerable to market shocks and competitive pressure, if for no other reason than being tied to a single make. On present trends, we can expect them to vanish entirely within ten or fifteen years. This is the conclusion of my series on car dealer megatrends. 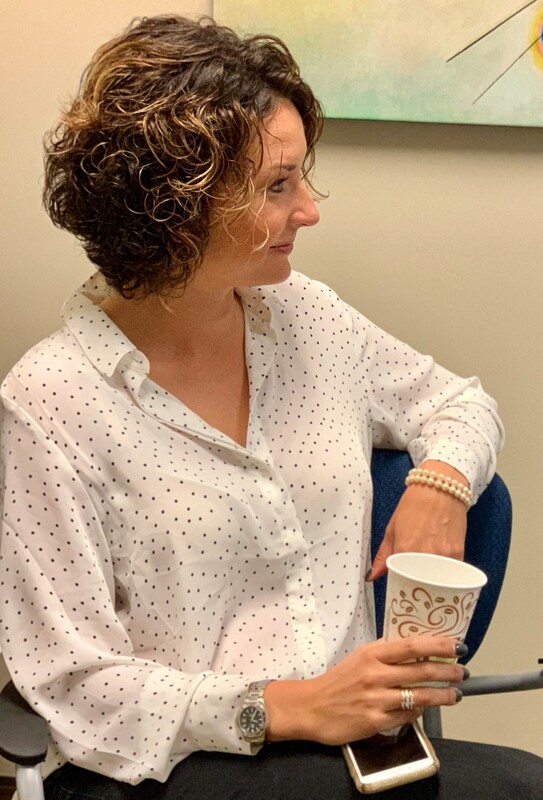 The first three articles covered the long running trend toward consolidation, steadily improving process maturity, and disruption from new technology. Like all good megatrends, these three flow together, reinforcing each other to produce a sea change in the industry. Consolidation means bigger groups with more money to spend on technology, and the scale to exploit improved procedures. Big dealer groups crave stability, and repeatable successes. In my trade, software development, we have a formal process maturity model. The bottom rung is where your success depends on “heroes and luck.” When you own 20 stores, you are less interested in one superstar killing the pay plan, and much more interested in a hundred guys making base hits. If you are not clear on this, I recommend the movie version of Moneyball, featuring Brad Pitt as Billy Beane. We’re making less per transaction, but we’re doing more transactions. 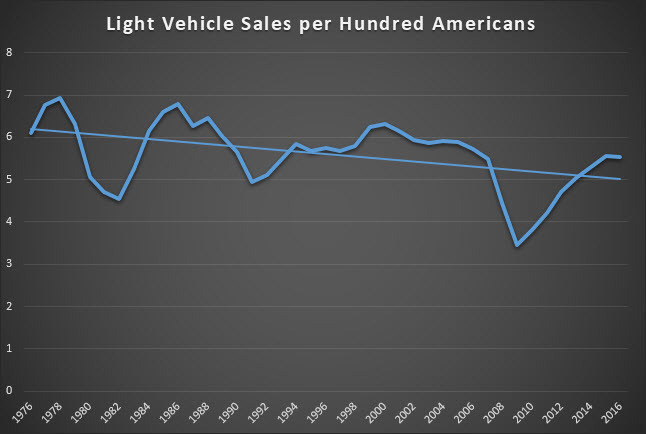 I work mainly in F&I, but you can see the same general idea in the velocity method for new and used car sales. That idea is margin compression. The quote above is from Paragon Honda’s Brian Benstock and, last I checked, he was still hard at it. The locus of high gross shifted from new cars to F&I, and then from finance to products. Smart people tell me the 100% markup on products will soon be ended, either by competition or by the CFPB. Today, when you read about the latest PVR record from Group 1 (or whomever) you will also read management downplaying expectations of further such records. The executive, however, said the group’s F&I operations may have reached the peak in terms of PVR. 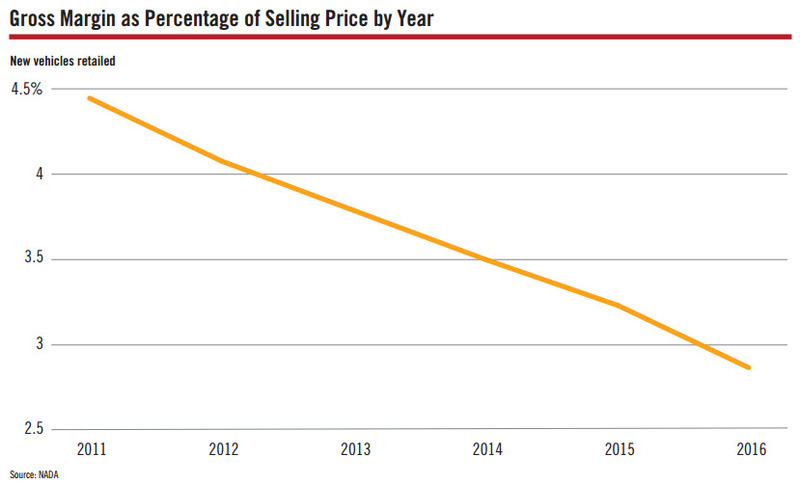 Dealership ROI is above 20% but, as you know, highly cyclical. The stock market has been around 14% lately and, arguably, less volatile. AutoNation has been chugging along at a steady 10%. Investors will accept a lower return, in exchange for stability. AutoNation was founded in the era of big box retail. My colleague there, Scott Barrett, came from Blockbuster. It was always our intention to remake auto retail in the image of Circuit City, which, by the way, was the parent of CarMax. I spoke with an ex-AutoNation executive recently who told me that learning to live with margin compression is an explicit part of their strategy. It is an iron law of economics that, in a free market, competition will drive margins toward zero. Have a look at this NADA chart. In five years, gross has been cut almost in half. This is a breathtaking diminution, and then you go on the industry forums and find people bitching that vAuto has cut used car gross, and TrueCar has cut new car gross, and now some idiot proposes to cut F&I gross by putting VSC prices online. Marv Eleazer has called this a race to the bottom, and he’s right, but this is not a race you can opt out of. That’s not how competition works. Think of it as a race run in Mexico City. The smart dealers and big groups are already training to compete in the thin air of lower gross.